I’m a bit reluctant to give out Singletrack Recommended awards to drivetrains. Because really when it boils down to it, all they do is shift gears. It’s not as if they control suspension, or keep you stuck to the trail, or finely moderate your descending speed. 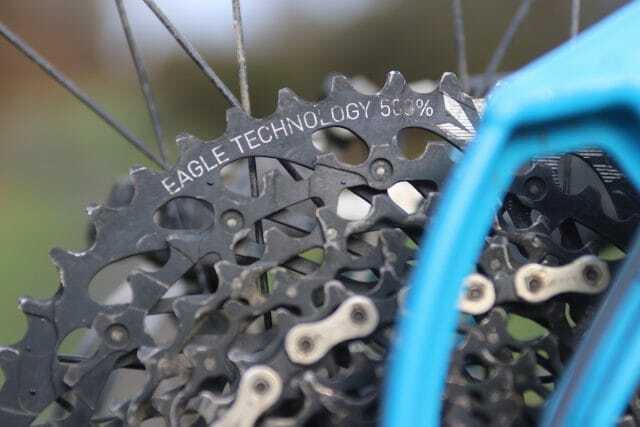 At the risk of sounding like the voiceover for an SUV commercial though, SRAM GX Eagle is more than a drivetrain. It’s a lifesty…just kidding. It is just a drivetrain, albeit one that works very well. It shifts through its 12 gears with wonderful efficiency and minimal fuss, and it’s super tough. Plus, it’s nearly a third of the price of XX1. It isn’t just about adding a 12th gear though. What that 12th gear does, with its 500% range, is almost eliminate the need for a front derailleur. And if you don’t need a front derailleur, frame designers get excited. Tyre and mud clearance can be increased. The BB area can be made stiffer, and chainstay length can be made shorter. 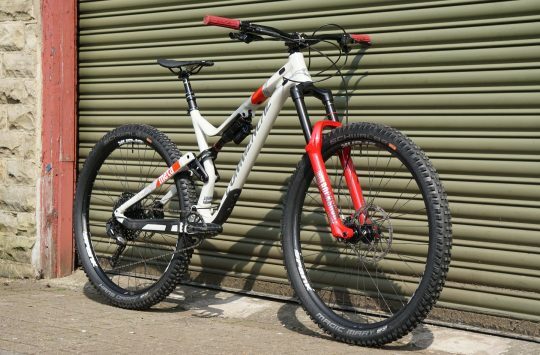 On full suspension bikes, the main pivot can be built wider and stronger, and its location can be optimised around a single chainring. Like the Orange Stage 5, more frames are being specifically designed around 1x drivetrains. Of course XX1 made all of this achievable in 2016, but it’s been GX Eagle that has made the technology truly accessible. 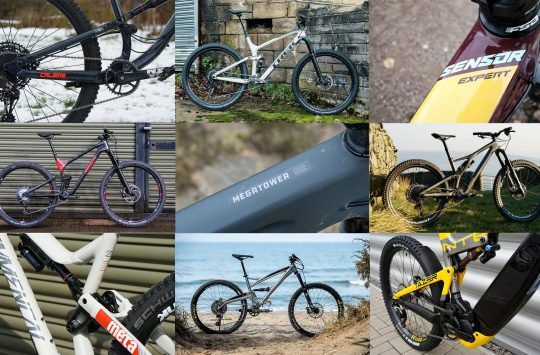 For frame designers and product managers considering a whole range of spec levels for one model of bike, the decision to eliminate the front mech has become that much easier. Indeed SRAM’s decision to skip X1 and go straight to GX for its latest Eagle drivetrain proved to be the winning move of 2017. For 2018, it’s absolutely everywhere – and for good reason. Since its release, I’ve put eight months of riding on our longterm test drivetrain. In addition to that, I’ve ridden half a dozen test bikes fitted with GX Eagle, so I’ve become pretty familiar with its performance, setup quirks and durability. With that in mind, lets take a closer look at the components that make up this entry-level 12-speed drivetrain, and how they’ve fared over time. Girder-like 7000 series alloy arms are tough. Much of GX Eagle’s price comes down to the crankset. Instead of fancy hollow carbon arms like on XX1, the GX Eagle arms are solid-forged from 7000-series alloy. As such, weight has increased by about three Wispas to 629g (32T chainring, no BB). Regardless, the girder-like arms are hugely stiff and tough. Not having to worry about gouging carbon cranks into granite is also nice. We’ve had zero issues with the GXP bottom bracket. Our test cranks came with a regular 24mm steel GXP spindle, and durability with SRAM’s own GXP threaded bottom bracket has been fine. The GX Eagle cranks have also been available in a BB30 version, though as you’ll likely have already read, SRAM has just announced its new DUB crank axle standard. Using a 28.9mm diameter alloy spindle and four different accompanying bottom brackets, the theory behind DUB is to provide a stiff and light crankset, but with greater compatibility with more frame standards. Expect to see DUB showing up on 2019 model year bikes, as in time, SRAM expects to replace both GXP & BB30 entirely. The smooth X-Sync 2 chainring takes performance to the next level. 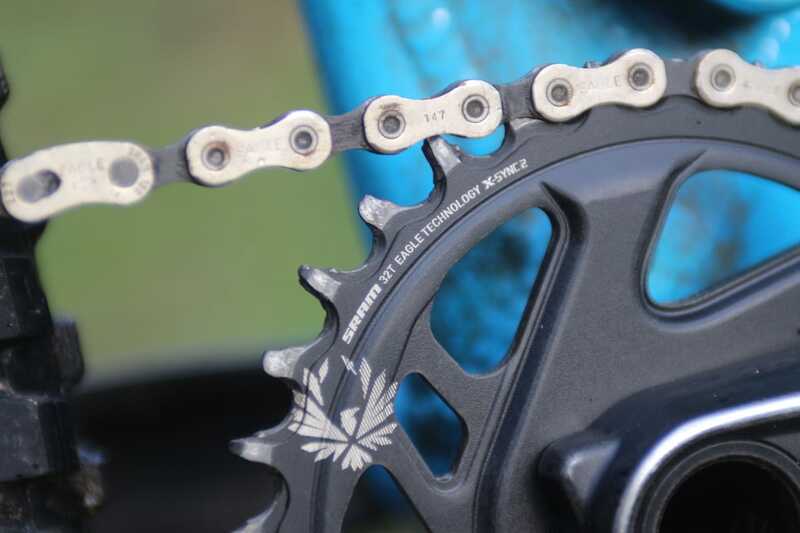 The X-Sync 2 chainring is easily one of the standout performers for GX Eagle. It’s smoother than previous X-Sync chainrings, but it’s the drastic improvement in durability and chain retention that puts it well above other narrow-wide chainrings. 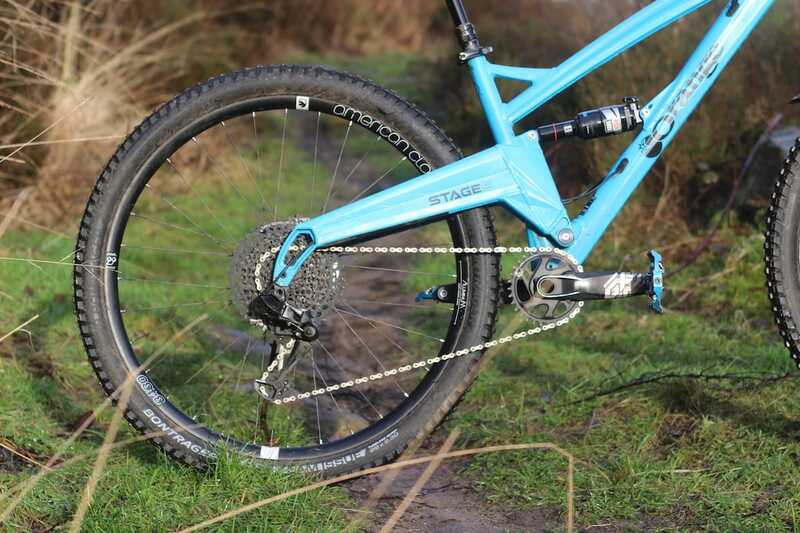 I am still yet to drop a chain with any of the half dozen GX Eagle groupsets I’ve tested. 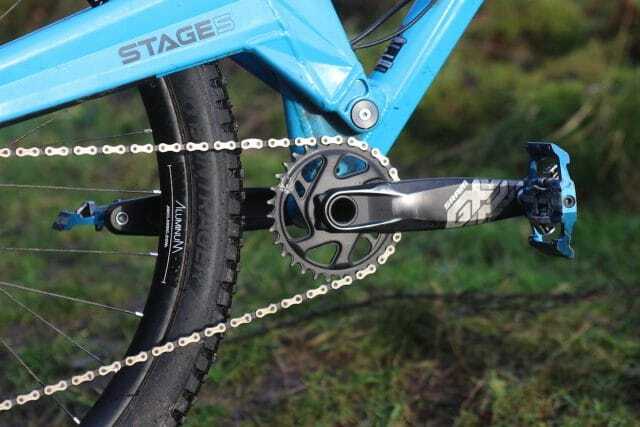 This X-Sync 2 chainring is also compatible with other 11 and 12-speed drivetrains, making it an excellent standalone upgrade if you’re dropping chains a lot with your existing setup. The GX Eagle trigger shifter lacks adjustability compared to X01 and XX1. Shift feel is characteristically SRAM, with chunky downshifts and a short, punchy upshift. The forged alloy lever isn’t adjustable like it is on XX1, and the paddle shape is a little pointier on the thumb. And while I’m nit-picking, I do miss the double-upshift that Shimano shifters offer. 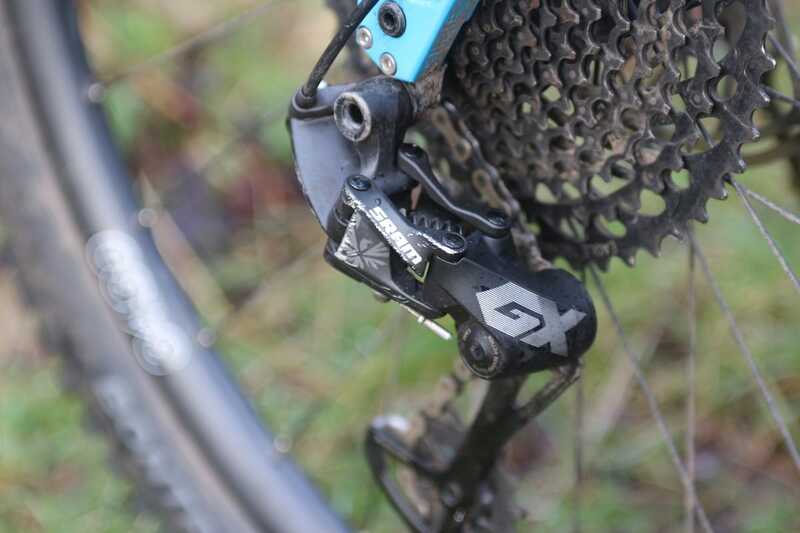 Regardless, the GX shifter works, and it integrates cleanly with SRAM brakes via the MatchMaker X clamp. A grip shift option is also available. Shifting isn’t quite as smooth as XX1, but the rear mech is tough. 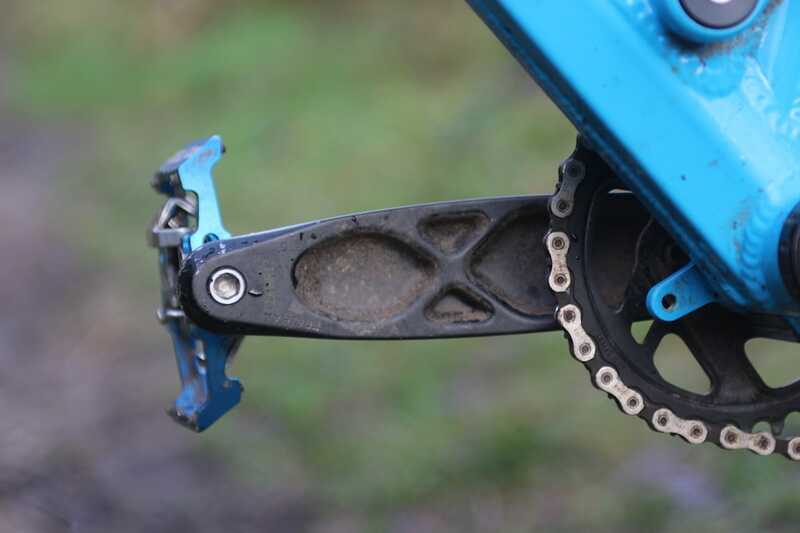 Similarly, the rear mech omits some of the exotic materials of XX1 while achieving much of the same performance. There’s a die-cast alloy construction and a steel spring (rather than the forged alloy and titanium spring found on XX1), but otherwise it still has the same jockey wheels and the same Type 3 clutch. Clutch tension is smooth but firm, with none of the knocking issues that plagued earlier generation clutches. And the Cage Lock button is still my favourite aid for taking the rear wheel off the bike. The mech is bulky, and sticks out further as you click into the higher gears. Despite sticking out much further than Shimano’s Shadow Plus design, the GX Eagle mech has shrugged off plenty of close encounters with rocks, and is still shifting reliably. It is sensitive to setup though, so make sure you get that B-tension right and it’ll do as told. One thing to be careful of is when removing the rear derailleur. If you undo the main mounting bolt without the Cage Lock engaged, there’s enough friction that it’s possible for the B-tension plate to stick, and the circlip that holds the main bolt in place can ping off. That happened to me in the workshop late one night while packing a bike for a riding trip over to Finale Ligure. I managed to find the circlip, but I couldn’t get it back on as it’s a royal pain in the arse. The derailleur will fit fine without the circlip, but it means the mounting bolt can fall out completely. Now if I pull the derailleur off the hanger, I thread a cable tie through the main bolt to keep it safe. Same 500% range as XX1. Aside from the cranks, the other key cost-saving area is the GX cassette. The 50t dinner plate is machined from alloy, and it’s pinned together with the other 11 stamped steel sprockets via no fewer than 123 stainless steel pins. This adds a bit of weight over XX1 (448g vs 360g), but it is literally less than half the cost. 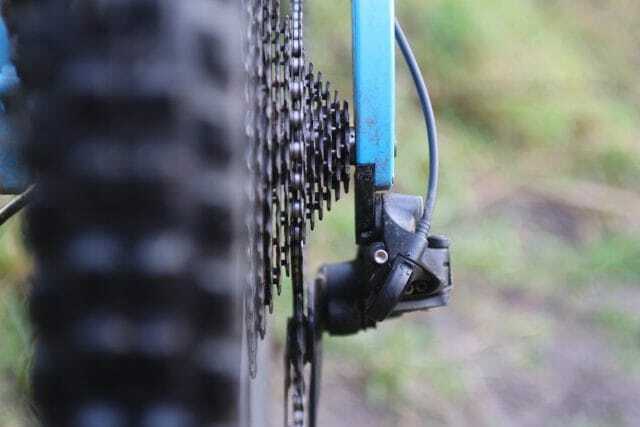 The sprocket sizes and 500% ratio is the same, and while the shifting isn’t quite as smooth, it’s very close, and it’s a sizable improvement on GX 11-speed. Durability on the chain and cassette is outstanding. Teeth wear has been impressive. Yes it’s still a £170 cassette, but in our experience, durability on these is (like with XX1 and X01 cassettes) exceptionally good. And if you don’t need to replace cassettes as often, that price is a whole lot easier to swallow. Much of this durability also comes down to the chain, which is – unbelievably – still yet to pass 0.25 on the chain wear gauge. The super-narrow chain doesn’t get the hollow chrome-hardened pins as the XX1 chain, but it has proven to be just as tough. And it’s £26 too. With GX lowering the price for entry, 1x is likely to be in many more riders futures. 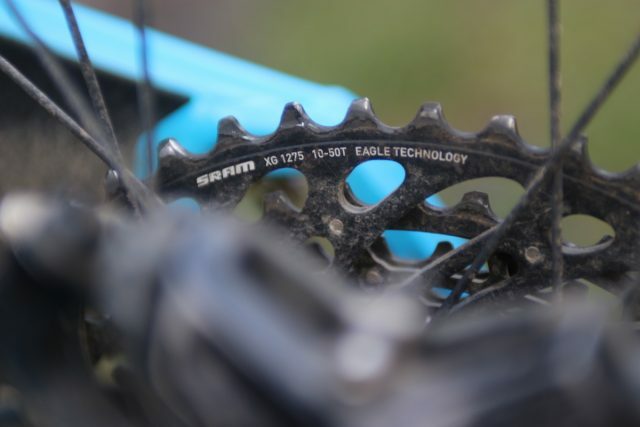 SRAM GX Eagle may have only added one more gear over its 1×11 predecessor, but it’s improved in almost every way. 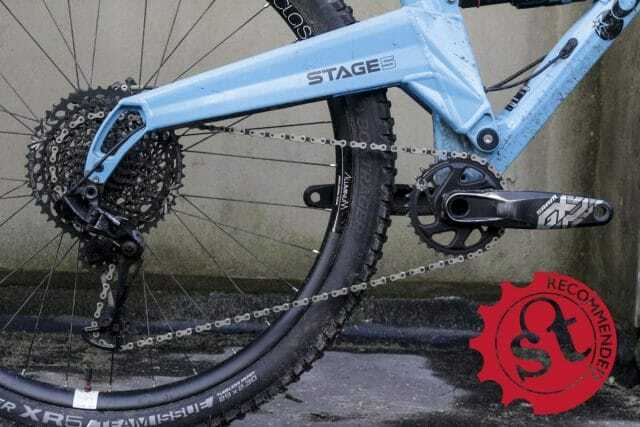 It has more range so you can run a bigger chainring for more top-end speed, or in my case, run the same size ring and enjoy a new lower climbing gear. It’s smoother overall compared to GX 11-speed, but it’s the leap in durability and chain retention that makes it a standout groupset for the money. Sigh. 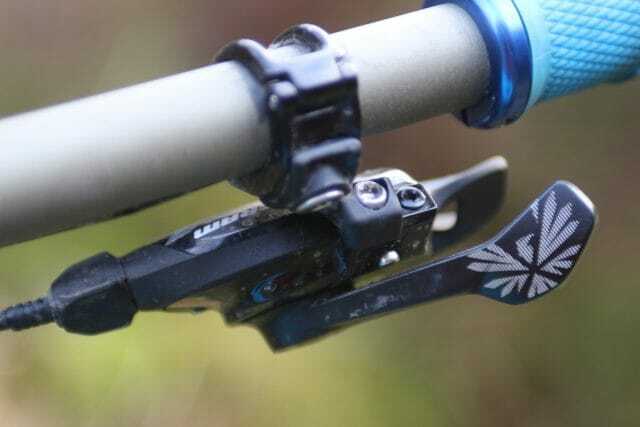 Shimano need to get a move on. Otherwise come the next cassette change this is what I will be heading for. I prefer the xd freehub as well. It is a better thought out piece of kit than a freehub that gets gouged and has to be replaced as well. only £345 at CRC atm…! a customer of mine bought a bike with 12 speed GX on it, 4 months in the BB has died (replaced with a Hope) the rear hub outer XD bearing has seized up (replaced with an Enduro but i still don’t think that will last as the bearing is half hanging out of the hub with only the 12 speed cassette covering it), the lower jockey wheel bearing has seized up (stripped and cleaned it to get it working again, would like to fit Hope jockey wheels but they don’t make them yet and Zyro only list jockey wheels at £32 and not bearings so i have ordered some tiny bearings from Enduro to press into the jockey wheel.) it has been ridden through the winter but has been cleaned properly. this is not good. i freely admit that i am a Shimano guy but i was considering a switch to Sram on my road bike but i just don’t think their stuff stands up to Uk conditions that well. and now another new crank standard? FFS, shops are getting backed up with constantly evolving stock standards that means what they have last week is now not wanted by customers because the Emperors new close are available and they must have them but it’s already discounted online, no wonder the IBD’s are closing. the bike trade is screwed long term, and when the customer finally realises it, it will be too late. I’ve also ended up with a siezed GXP BB after 4 months of winter riding. Managed to bend a single tooth in the middle of the cassette too! Luckily that has bent back and is shifting fine. Overall I am impressed with the groupset though, but I came off a 2×9 so have little to compare it to in the 1x world. 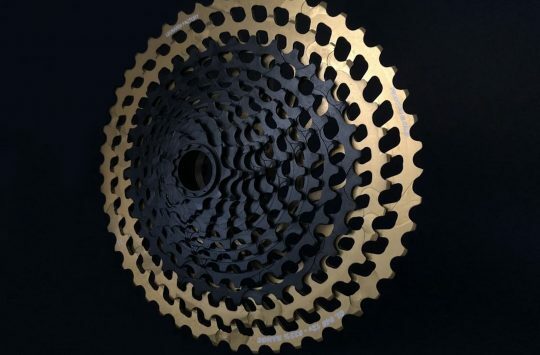 10 speed SLX cassette AND chain £34 at CRC. Another 30 quid for 2 new rings for the double up front. Hope bb to last years is 70. Jocket wheels a fiver when needed dye to wear. So i get to keep a better range of gearing in my Orange 5, with a standard BB that doesnt creak or fsil after 10 minutes, and the olny downside is the weight of the front mech and shifter. Which is sodall conpared to the 10 pounds of cack that is plastered onto the bike each ride this time of year. @ff29 – agreed about the XD freehub system. It’s a pleasure to use, and the lack of cassette sprocket gouging on lightweight alloy freehub bodies is a big plus too. @neilc1881 – I’ve not had any negative experiences with modern GXP bottom brackets myself. Both this one here, and also the GXP crank and BB on our longterm Whyte T-130 test bike that was pummelled over two winters of use, are still running smoothly. 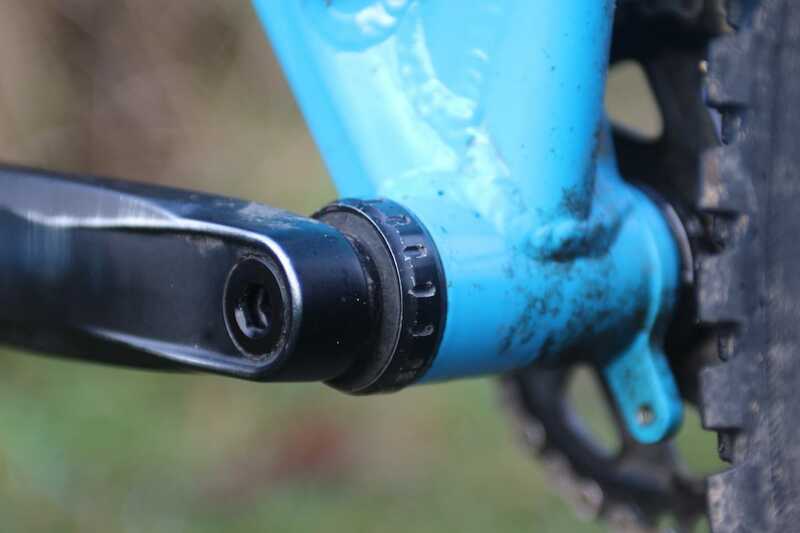 That said, SRAM has indicated that the new DUB bottom brackets have upgraded both bearing and sealing quality, and certainly in the hand (we haven’t ridden them yet), they do feel very snug and smooth. Ladies and gentlemen. May I introduce you to Wil. He’s on holiday right now. Well, he’s meant to be. Re reliability. Been running force 1 on my mason for over a year. It has been faultless. Sram bb. Re other bottom brackets. I have had a shimano seize. A hope ceramic bb ball break. Go for a wet muddy ride and then leave the bike standing. It is the kiss of death. They all break in my view. I remove my crank arms and dry and then grease the bb every couple of months now. That has helped a lot. I’d agree – it needs to be done, although it’s good to hear some people are not having any issues with their GXP BBs, I can’t claim to have been impressed. No jet wash or degreaser used on mine, just weekly rides in a wet winter. Non-drive side has seized. Will be regreasing the next one regularly! regards maintenance, you’d be surprised how many people have mid to high end bikes and have no clue how to maintain them, clean them and generally look after them, my point in regards to GX 12 speed is that it’s cheap enough that it is on bikes at not daft money and retailers are doing a good job of flogging it, but when it gets sold to someone who isn’t able to remove the cranks etc (even though we all know it’s a piece of piss) they then end up moaning in shops and on line about the problems, i have no doubt that if i owned the bike that had the BB die inside 4 months then it would have lasted longer, but the people who are buying this stuff can’t or won’t look after it like i would, then it dies and comes the cry for warranty and grumbling because they don’t understand why it may be their fault, and even if they do understand they are pissed that they spent 2 grand and 4 months in the product fails, and while i’m not saying other brands are all perfect i see more failures with Sram than i do with Shimano by a country mile. I’m very impressed with the Eagle set up on my Four. But has anyone has issues with the chain dropping off the chainring in heavy mud? Not uncommon apparently and something none of the reviews mention.